iami Project to Cure Paralysis scientists Mary Bartlett Bunge, Ph.D., and Damien Pearse, Ph.D., announced a major breakthrough in their research on recovering function after spinal cord injury. “These are the best results we’ve had in 15 years,” Bunge said at a news conference announcing the results. The study tested an innovative treatment that combined Schwann cell grafts with injections of cyclic AMP, a cell messenger molecule, and Rolipram. Cyclic AMP influences the inner workings of cells and is important for guiding axons and their growth within inhibitory environments. Rolipram prevents the breakdown of cyclic AMP. The combination of the cyclic AMP and Rolipram with the Schwann cell grafts saved axons from dying and resulted in more axon growth within the Schwann cells. The animals had a 500 percent increase in nerve fibers in the graft area and were able to regain 70 percent of their normal walking function. In addition to striking improvements in walking, the investigators also found that the combination therapy helped protect nerve fibers from dying and promoted new growth of fibers into—as well as beyond—the area of injury. The study was published in the June issue of the prestigious Nature Medicine journal. 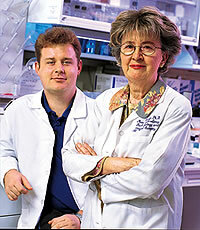 he University of Miami’s Bascom Palmer Eye Institute was ranked No. 1 in the country for ophthalmology in the 15th annual survey of “America’s Best Hospitals” published in the July 12 issue of U.S. News & World Report. Seven other specialties at the University of Miami/Jackson Memorial Medical Center also were ranked as among the nation’s best. “Our clinical, educational, and research enterprises continue to grow in size, scope, and quality, making it possible for Bascom Palmer to reflect the world of ophthalmology in the 21st century,” says Carmen A. Puliafito, M.D., M.B.A., chairman of Bascom Palmer Eye Institute. Bascom Palmer has been ranked in first or second place every year the rankings have been published. The seven other UM/Jackson programs in the rankings are kidney disease (ranked No. 19); digestive disorders (23); ear, nose, and throat (26); hormonal disorders (26); urology (30); geriatrics (33); and neurology and neurosurgery (35). University of Miami specialties moving up in the rankings this year, in addition to ophthalmology, were digestive disorders; hormonal disorders; urology; ear, nose, and throat; and kidney disease. The standards for ranking in “Best Hospitals” are rigorous. Out of 6,012 U.S. medical centers (military and veterans’ hospitals are not included), only 177, or fewer than 1 in 30, were of high enough quality to be ranked in even a single specialty this year. ne in six men may be diagnosed with prostate cancer in their lifetime—about 230,000 new cases in America every year. As many as half those patients will suffer from metastasis, mostly to lymph nodes, lungs, and bones. Intrigued, he attended a conference on clinical applications for MMP inhibitors and found what he was looking for—in the form of a dentist. Lorne M. Golub, D.M.D., M.Sc., is a dental researcher at the State University of New York at Stony Brook and a pioneer in the use of MMP inhibitors to fight diseases of the teeth, gums, and bone. He agreed to help. At UM, Lokeshwar and Marie Selzer, B.Sc., a senior research associate, tested several MMP inhibitors. They identified a chemically modified tetracycline, called COL-3, which worked against metastasis and didn’t appear to have the side effects of tetracycline. In laboratory experiments, they found that COL-3 greatly reduced the spread of prostate cancer and shrank tumors that had spread to the bones. Several phase II clinical trials are now under way around the country testing COL-3 to treat cancers of the prostate and other organs, including AIDS-induced Kaposi’s Sarcoma, a debilitating skin cancer. three-year, $3 million grant from United Health Foundation will establish a primary care Center of Excellence at the Jefferson Reaves Sr. Health Center in the Overtown section of Miami. 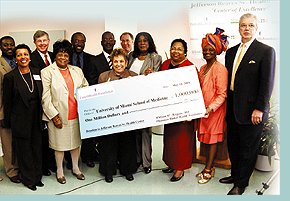 Jefferson Reaves is one of 12 Jackson Health System primary care centers in Miami-Dade, and it also serves as a teaching facility for the School of Medicine’s Department of Family Medicine and Community Health. The Center of Excellence will introduce aggressive patient and community population screening to identify at-risk people, help them with risk reduction activities, and provide the medical care necessary to treat their condition and prevent long-term complications. Additional clinical and support staff will work together to create a new approach to primary care medicine. “We’re very excited about the opportunity of really beginning to change to some degree the model of primary care that’s been around for the last 30 years or so. The 15-minute office visit, to my mind, is an outmoded way of practicing health care,” said Robert Schwartz, M.D., professor and chair of the Department of Family Medicine and Community Health, at the news conference announcing the grant. n recent years, great strides have been made in treating children with cancer, but the treatment that keeps them alive can have deadly consequences: a vastly increased risk of cardiac damage. Steven E. Lipshultz, M.D., professor and chair of the Department of Pediatrics at the School of Medicine, was the lead author of a study recently published in The New England Journal of Medicine that could help children diagnosed with cancer avoid potentially fatal cardiac problems caused by their treatment. Of the 250,000 survivors of childhood cancer in the nation, more than 50 percent were treated with doxorubicin (Adriamycin®) or another anthracycline, a form of chemotherapy known to cause heart damage. But doxorubicin is the most effective therapy for acute lymphoblastic leukemia (ALL), the most common malignancy in pediatric cancer patients. In the study, half of the patients in the multicenter, randomized, controlled trial, conducted out of Dana-Farber Cancer Institute in Boston, were treated using the standard multi-agent protocol for ALL, which includes doxorubicin. The other half were treated with an infusion of dexrazoxane, 30 minutes before receiving doxorubicin. Dexrazoxane is a free-radical scavenger that has been found to protect the heart of adults receiving the same type of chemotherapy. The potential benefit for the treatment of childhood cancer is enormous: an estimated one in 570 young adults ages 20-34 will be a cancer survivor by the year 2010. The new protocol may help them to live even longer. ne of the difficulties researchers face when dealing with experimental models is being able to see the results of their work. A powerful new imaging tool will give University of Miami School of Medicine scientists a noninvasive way to see more than they’ve ever seen before. 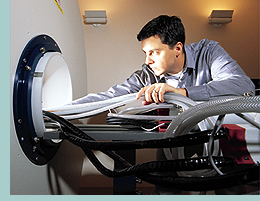 Most human diagnostic magnetic resonance imaging (MRI) systems operate with a magnetic field of 1.5-tesla. The most powerful diagnostic systems are 3-tesla—MR Services in the Department of Radiology has one. On the eighth floor of the Batchelor Children’s Research Institute, the University recently installed a 4.7-tesla research magnet—the only one in South Florida. “It allows researchers to look at structures of any part of the body,” says Daniel Armstrong, Ph.D., director of the Mailman Center for Child Development. This tool gives scientists greater precision. For example, it can monitor blood flow to the brain in real time. “The MR will let us see the chemical makeup of tissue, visualize spinal cord circuitry, or see what happens to the brain after stroke,” says Armstrong. It also allows researchers to study progress in an experimental model, actually tracking the body’s response to a treatment—another first. Five research protocols are already cued up to use the new tool, all investigating stroke and the central nervous system, and there are many other potential uses. The purchase was made possible by a grant from the Health Resources and Services Administration within the U.S. Department of Health and Human Services, with operational support provided by the School of Medicine, the Departments of Neurology, Radiology, and Pediatrics, and The Miami Project to Cure Paralysis. n established treatment philosophy is being put to a new use as part of a yearlong research project in the Departments of Surgery and Pediatrics. 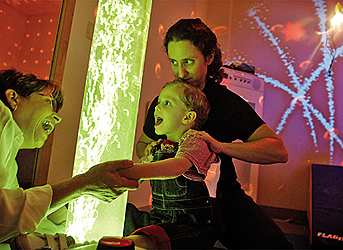 Under the direction of neurotrauma researcher Gillian Hotz, Ph.D., and John Kuluz, M.D., co-director of the Pediatric Rehabilitation Unit, the multisensory Snoezelen room at Jackson Memorial’s rehabilitation center is being used to treat children with brain injuries. The room is equipped with a leaf hammock chair floating in the air, a plastic tube filled with colored bubbles, fiber optic colored cables, and other innovative devices designed to stimulate the senses. The Snoezelen philosophy, developed in the Netherlands in the 1970s, has proven that surroundings can have a profound effect on behavior. In thousands of such rooms worldwide, research has shown the therapy helps autistic children, elderly dementia patients, and other nonresponsive patients begin to communicate. But little research has been done with brain-injured children. As part of a one-year grant from the Florida Brain and Spinal Cord Injury program, at least 20 brain-injured children will receive treatment in the Snoezelen room. Early findings presented by Hotz at the international Snoezelen meeting in Israel in May showed measurable behavior changes in previously unresponsive children. Nine-year-old Tavarious Williams was injured in a car accident and was reacting very little to his environment before visiting the Snoezelen room. “He can now follow things with his eyes, makes sounds, and even moves his head back and forth. We’ve seen a big improvement,” says Hotz. The entire team was trained by experts from Beit Issie Shapiro, a center for children with disabilities in Israel that uses Snoezelen techniques. In collaboration with these experts, Hotz is hoping to make the UM/Jackson room the U.S. training site for Snoezelen therapy. 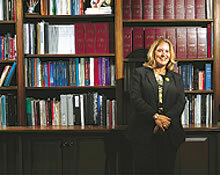 arilyn Glassberg Csete, M.D. ’85, assistant professor of medicine, was recently selected as a Local Legends award winner from the state of Florida for her commitment and innovation in the field of pulmonology, as well as for her contribution to the positive image of women in medicine. The Local Legends project was created by the American Medical Women’s Association and the National Library of Medicine. All members of Congress were asked to participate by nominating up to three women physicians from their state deserving of special recognition for their outstanding contributions to medicine. Florida Senator Bob Graham and Representative Lincoln Diaz-Balart nominated Glassberg for the award. he Division of Physical Therapy, part of the Department of Orthopaedics and Rehabilitation since 1986, is now officially its own department at the School of Medicine. Sherrill Hayes, Ph.D., P.T., who has headed the division since 1985, is now chair of the new department. The structural shift was approved by the University Faculty Senate in March. The primary mission of the Department of Physical Therapy has always been education and research, with the overriding goal of preparing individuals for the clinical practice of physical therapy while preparing others for teaching and conducting research. The department offers two degrees; the entry-level professional Doctor of Physical Therapy (D.P.T.) 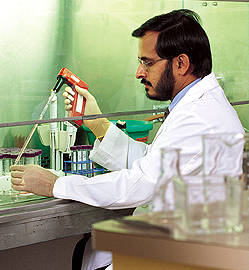 program and the Ph.D. program. The educational component has been ranked among the top 10 out of 228 graduate physical therapy programs in U.S. News & World Report for the last ten years. o need for reading glasses as you age? No more cataracts? That may be hard to imagine, but a new procedure being developed at Bascom Palmer Eye Institute could one day revolutionize cataract surgery and make aging eyes young again. The treatment involves replacing the contents of the eye’s lens with a soft polymer. The polymer gel reproduces the characteristics of a young adult’s lens. Scientists at the Australian government’s multinational Vision Cooperative Research Center are developing the gel, while Parel’s team is perfecting the surgical techniques. Initially, researchers expect the technology will be used in cataract surgery. Parel will present the latest findings at the joint meeting of the American Academy of Ophthalmology and European Society of Ophthalmology being held in October in New Orleans. He hopes to begin human testing as early as next year.